Yesterday, while many of us were in our beds trying to get over sea sickness, Mark Fenwick (the token biologist) and several of the crew deployed the Continuous Plankton Recorder (CPR), just south of Stewart Island. The CPR is a rather ingenious contraption; it was first invented by Sir Alister Hardy in 1926 and used during the Discovery expedition to the Antarctic. 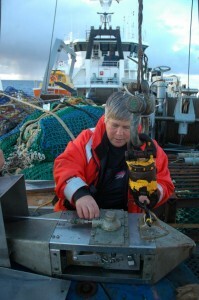 The instrument – which is a metal box in the shape of a fish – was designed to be towed behind any ship at a water depth of about 10 m. Water passes into the CPR at the front, and plankton are filtered onto a slow-moving band of silk (270 micrometre mesh size) and covered by a second band of silk. The silks and plankton are then spooled into a storage tank containing formalin (or formaldehyde) to preserve the plankton so they don’t rot. On return to the laboratory, the silk is removed from the mechanism and divided into samples representing 10 nautical miles (19 km) of tow. The plankton preserved in the silk are then identified and counted by specialist plankton taxonomists. 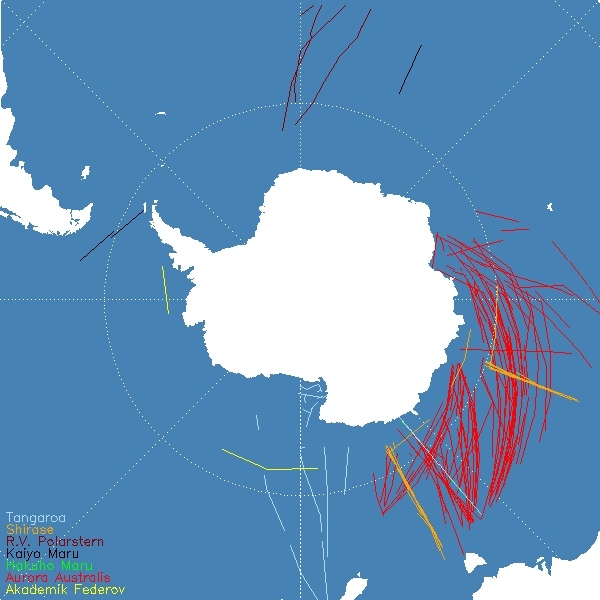 The Southern Ocean Continuous Plankton Recorder Survey (SO-CPR) is an international program, currently involving Australia, Japan, Germany, and New Zealand, which has been running for a couple of decades. The CPR silks from this voyage will be sent to our colleagues at the Australian Antarctic Division in Hobart for analyses. The overall aim of the CPR surveys in this region is to map the biodiversity of the plankton. Plankton are at the top of the food chain in the oceans and thus any changes to their quantity and distribution will affect the higher organisms that live off them, such as fish and the whales. Most of the science crew are recovering from their sea sickness and are up and about today, ready for our first proper sampling station tomorrow – stay tuned! * See the ‘Blue Whale News Blog’, which is chronicling the Amaltal Explorer’s current voyage looking for the world’s largest creature – the Antarctic blue whale. 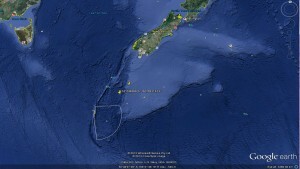 The 2013 Antarctic Blue Whale Voyage – or VWhale – departed from Nelson, New Zealand on board the MFV Amaltal Explorer on January 29, 2013.